Sometimes, the way you dress is an outer reflection of your personality. It's never wrong to dress up whatever you feel like dressing. There are many types of clothing style, i'm not really good in fashion... But...What i concern about is just"comfortable". You know what, i always spent time standing in front of my wardrobe before i go out.. I can easily done my makeup in less than 30 minutes, but barely pick a suitable outfits ALL THE TIME.. That's why i always ended up wearing some casual outfits.. which is ( singlet + shorts / high waist pants, Tee + legging/shorts ) HAHAHA! Ok, look! These are my favorite OOTD! 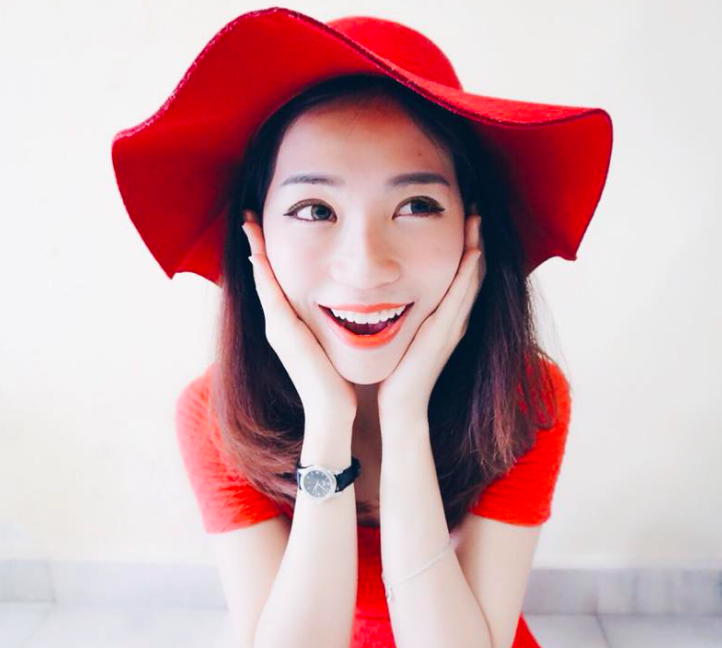 You know right..i seldom blog about FASHION in my blog. But this time is different! hahaha. I'm a big fans of Miss Selfridge. Therefore, I'm here to introduce their LATEST AW13 collection- The Collective they just launched! Check it out !! 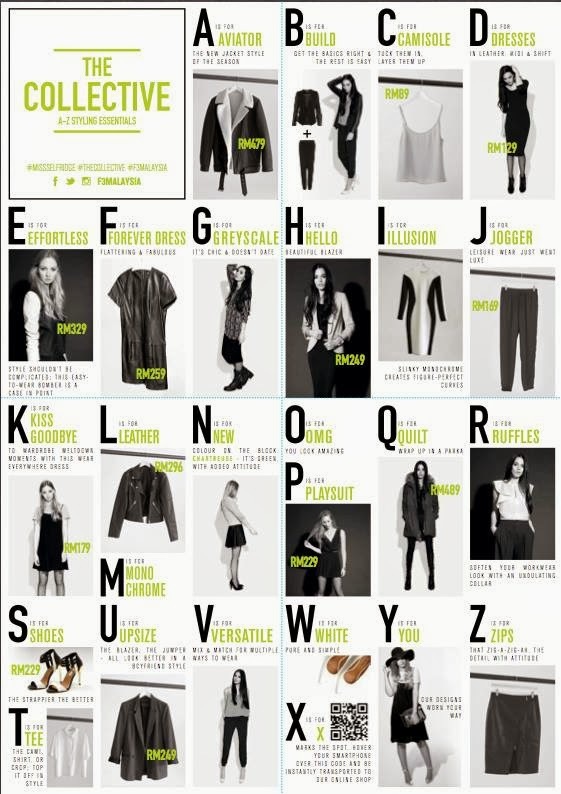 The collective is introducing some traditional item for example : tee, blazer, skirt, biker jacket loose top etc. Mix & Match is really fun! The Collective will be available in store now! Alright, i have something for your readers! Are you interested to win yourself the collection outfit that worth RM800? If yes, capture yourself with your best AUTUMM WINTER outfits and upload it in your INSTAGRAM! 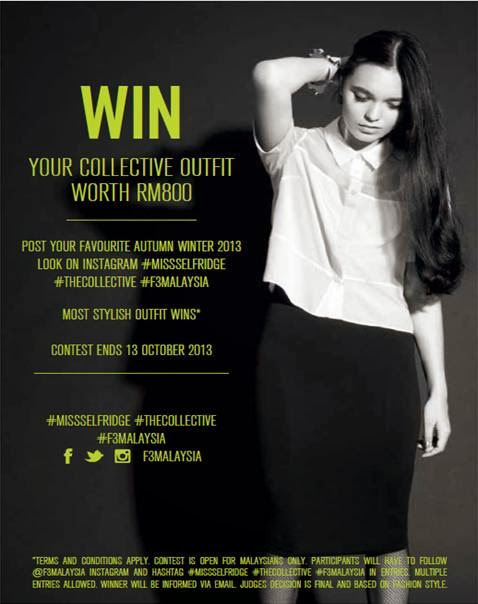 Don't forget to hashtag #MISSSELFRIDGE #THECOLLECTIVE and #F3MALAYSIA! The most stylish one will get to WIN the prizes! The contest is already started today and ends 13 october 2013! So.. hurry dearie!! Don't miss this! Start Styling yourself get a chance to grab this prices!